Versa-Matic E2HP High Pressure Double Diaphragm Pump when pressure is critical, Versa-Matic’s E2HP 2″ high pressure double diaphragm pumps provide the performance you need. Versa-Matic E2HP High Pressure Double Diaphragm Pump features the Elima-Matic Air Valve System for non-stalling, non-icing, and lube-free operation. 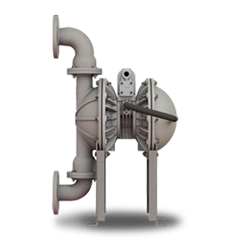 Click here for Versa-Matic E2HP High Pressure Double Diaphragm Pump detailed specifications.